I definately prefer the director's cut. I remember that one of us prefers the theatrical cut. It could have been you. MORE FOOTAGE AND MORE LAUGHS make this UNCORKED EDITION a "bust-a-gut, roll-in-the-aisle"* (Maxim)† comedy and the most raucous party of the year! Found myself in the mood for a comedy this morning. When I first popped this one in I was really enjoying it. Until it got to about the halfway point. There it lost a little something. This one is entertaining... but not what I would call great. 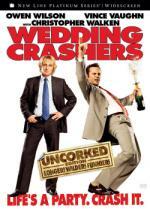 I do think that Owen Wilson and Vince Vaughn made a pretty good team. I think I've seen the Director's cut if it's the one Achim described. I'd tell you what I thought of the theatrical version, but that would involve having to watch the film again, which I don't plan on ever doing again. I am even considering giving part 3 a chance. I quite liked the third part (I have it reviewed before). I think you will enjoy it also. It's a slasher movie with a time-travel twist. Definitely have to put part 3 on my list! On the first one... if it is true that the only difference between the theatrical version and the Director's Cut is the ending... I may go back and just watch the last say 3 or 4 chapters of the theatrical to see the alternate ending. or can it be seen in one of the extras? While you list Jane Seymour as a TV star, I think the first thing I ever actually saw her in was a theatrical film. She was the Bond girl in Roger Moore's first James Bond film, Live and Let Die which I think came out in 1973. In the director's cut there are also a few additional scenes throughout the movie, which had to be cut when the ending was changed for the theatrical cut. Without them, the alternate ending will not make much sense. But maybe this article helps. I don't go by what they did first... I only go by the question "did they ever star in a TV Series?" But hey... that is me. OK got ya... wait till I watch the movie again. The movie "Somewhere in Time" with Christopher Reeve is the first thing that jumps to my mind when I hear her name! I have heard of that one (Somewhere in Time) many times... but never seen it. Would you say it is a must have? It's a good movie, but I am not sure if it is one for you. Well it was for me, but I really like both main actors and the time travel aspect of the movie; but it is essentially a romance movie. Sounds like for me it may be iffy... I will hold off... if I see it extremely cheap (or is given to me) I will probably give it a chance.